The song and dance list for this weekend’s Strictly Come Dancing has been released, so beware of spoilers ahead! There was not a dry eye in the house on Sunday night, when the much-loved Judge Rinder bid an emotional farewell to the BBC competition. The celebrity contestant just missed out on the Strictly semi-final after losing the dance-off to Ore Oduba and Joanne Clifton during last week’s results show. Unfortunately, his Samba was not enough to save him from eliminations with all four judges opting to send Judge Rinder home. The semi-final is now upon us and just four couples remain. 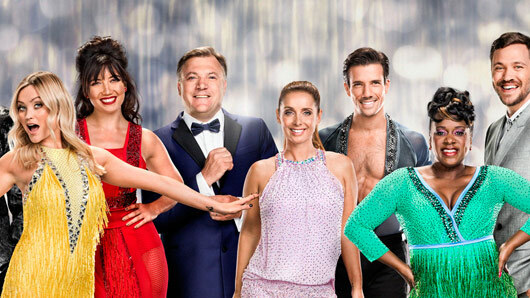 Claudia Fragapane and AJ Pritchard, Danny Mac and Oti Mabuse, Louise Redknapp and Kevin Clifton, and Ore Oduba and Joanne Clifton are left in the running to take home that famous glitterball trophy and this week they will have to take on not one, but two dance routines to impress the judges. Claudia and AJ will be dancing the Rumba to “Bleeding Love” by Leona Lewis and the Quickstep to “When You’re Smiling” by Andy Williams. Danny and Oti will be dancing the Salsa to “Vivir Mi’ Vida” by Marc Anthony and the American Smooth to “Misty Blue” by Dorothy Moore. Louise and Kevin will be dancing the Samba to “Brazil” by Thiago Thomé and the Tango to “Glad All Over” by the Dave Clark Five. Ore and Joanne will be dancing the Quickstep to “Are You Gonna Be My Girl?” by Jet and the Argentine Tango to “Can’t Get You Out of My Head” by Kylie Minogue.